101st Airborne Division Screaming Eagle Replacement Training School Scroll. Vietnamese machine embroidered. Unused. 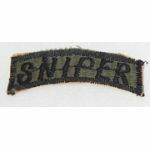 Vietnam 101st Airborne Division Sniper Tab. Vietnamese machine embroidered. Came out of an estate of a 101st Airborne Division Sniper. Unused. 11th Airborne Pathfinder Detachment Scroll. Vietnamese hand embroidered. Unused. 11th Airborne Pathfinder Scroll. Vietnamese machine embroidered. Almost seven inches long. Used. 13th Airborne Pathfinder Detachment Scroll. Vietnamese machine embroidered. Unused. 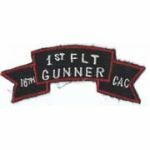 18th Combat Aviation Company 1st Flight Gunner Scroll. Vietnamese machine embroidered. Unused. 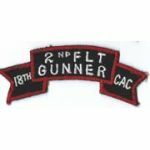 18th Combat Aviation Company 2nd Flight Gunner Scroll. Vietnamese machine embroidered. Unused. 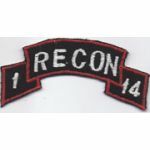 1st Battalion 14th Infantry RECON Scroll. Vietnamese machine embroidered. Unused. 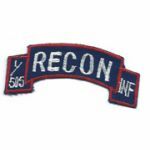 1st Battalion 505th Infantry RECON Scroll. Vietnamese machine embroidered. Unused. 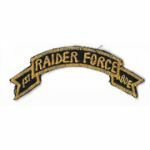 Vietnam 1st Brigade Raider Force 101st Airborne Division Scroll. Vietnamese machine embroidered. Unused. 21st Battalion Vietnamese Ranger Advisor Scroll. Vietnamese hand embroidered on a black background. Unused. 22nd Airborne Pathfinder Detachment Scroll. Vietnamese hand embroidered. Unused. South Vietnamese Army 2nd Ranger Group Advisors Scroll. Vietnamese hand embroidered. Unused. 3rd Brigade 506th Airborne Infantry Recon Platoon Arc. Vietnamese hand embroidered. Unused. ARVN / South Vietnamese Army Ranger 35th Battalion Advisor Scroll. Vietnamese hand embroidered. Unused. US Advisor To South Vietnamese Rangers 36th Battalion Scroll. Vietnamese hand embroidered on a camo background. Unused. South Vietnamese Army Ranger 36th Battalion Advisors Scroll. Vietnamese hand embroidered. Unused. South Vietnamese Army Ranger 39th Battalion Advisors Scroll. Vietnamese hand embroidered on a camo background. Unused. Vietnam 3rd Battalion 21st Infantry RECON Scroll. Vietnamese machine embroidered. Unused. 3rd Group Vietnamese Ranger Advisor Scroll. Vietnamese hand embroidered on a camo background. Unused.